Photos by Toni Siebert and David Karp, 1/15/2010, CVC. Photo rights. Source: Received as budwood from Florida (originally came to Florida, Budwood Registration Program, Winterhaven, from Venezuela), 1988. 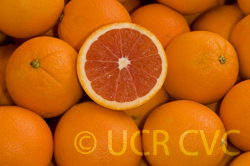 Parentage/origins: Cara Cara navel orange, a mutation that occurred on a Washington navel orange tree, was discovered in 1976 at Hacienda Cara Cara in Venezuela. From Venezuela, it was brought to Florida and then introduced into California, where it is well adapted. EMN, 4/1988: Needs Swingle test for canker. Tentative plan is to process for variety collection, full foundation set at Lindcove, early industry release, and fruit in screenhouse. Jack Hearn says this is a chimera and could revert to non-pink fruit through inadvertent selection of mutant bud. We probably should not release from any trees which have not fruited. EMN, 12/1989: Info brought back from Florida by Dr. Gumpf (hand written) says: This is a red-fleshed navel originally from Venezuela. 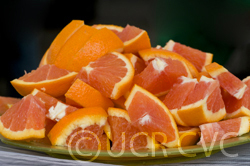 It grows well on sour orange, citrange, citrumelo, or trifoliata. It has a small navel; the fruits are slightly oblong. No blush to the skin which is of average thickness. Yields well. 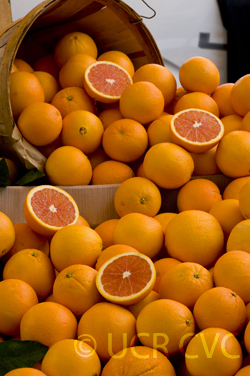 The flesh color in Florida is like that of Star Ruby grapefruit. 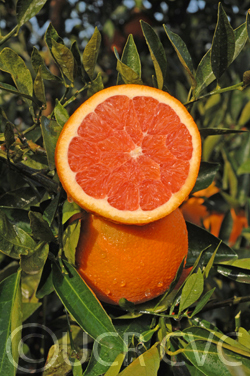 Most tree and fruit characteristics reflect its Washington navel orange ancestry, but the flesh is deep pink, similar to the darkest of the red grapefruit varieties. This rich color is due to the presence of lycopene, a carotenoid in the same family as beta carotene. Rarely, the normally green-leafed trees will produce variegated-leafed twigs. These twigs, when left to grow and fruit, may produce fruits with striped rind.